I haven’t mentioned my mom in any real capacity on this site, save for a mention of a Halloween costume. It wasn’t that she wasn’t with us when we were weeks and weekends at Walt Disney World, it’s just that it is tough to find pictures of her. You see, for most of my youth, my mother was the one with the camera in front of her face, making sure we would have memories to look back on years later. She was also the one who told my father that spending as much time at Walt Disney World as we did as children was bound to have some sort of effect on us... Well,... 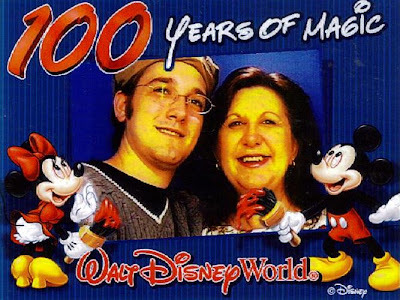 This is one of the few pictures I have of my mom at Walt Disney World, and it happens to have been taken six years ago today. On that day, I turned 21. At the time I was living in Florida and, because of work, had missed the holidays with my family the previous year and 2002’s Thanksgiving, and Christmas was not looking much better (as it would turn out, I would miss it as well). My mom was down visiting my grandmother, but made the out to see me. We drove up to Downtown Disney, window-shopped in the various stores, had lunch at Rainforest Café, and took this picture in a kiosk at The Art of Disney. She was the only person I ended up seeing on my birthday that year, and it is one of the happiest memories I have from my second stint of living in Florida. My mother, aside from being sentimental and having a camera attached to her face, has one other attribute that I picked up from her, making notes on everything. Turning the above picture over, you’ll find the following entry: That’s my mom, always there when you need her and always prepared. I was the person who, on this day twenty-seven years ago, made her a mother, and she is a big part of the reason I am the person I am today. Happy birthday to me, but more importantly, thank you to my magical mom! 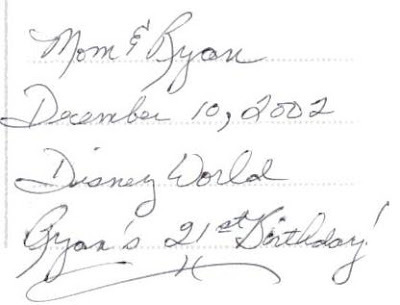 "Disneyholic"), that picture is priceless - not only is it of you and your mom, but it also contains a sample of her handwriting which in future years you will treasure!!! What a lovely post and much credit to your mum - and to all Disney Mums out there!